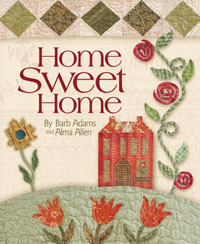 Best-selling authors Barb Adams and Alma Allen present Home Sweet Home, quilts and projects taht celebrate the home, community and friendships. The featured quilt has nine blocks reminiscent of early American sampler designs. Two versions of the quilt – one by Barb, one by Alma – are included. PLUS there are a total of 13 other projects … other quilts, a table runner, hooked rug and more. This entry was posted on Thursday, April 22nd, 2010 at 10:09 am and is filed under Uncategorized. You can follow any responses to this entry through the RSS 2.0 feed. You can leave a response, or trackback from your own site.